Today I've been here for three months which is kind of crazy.. I remember the day I left, and said bye to my family and Linnea on the airport in Gothenburg. I was crying so much. I could barely see anything and I couldn't focus at all. Everything was a blur. I saw my mom waving to me as I was hugging my sisters and Linnea and it didn't feel real. Not a single bit real. I went through security, totally forgetting to put liquids in bags (Thank god I was in Sweden though, because they didn't care) and I didn't know what to do or where to go because I don't even remember last time I flew. Somehow I found my way and I was crying so much, I just wanted to go back, I knew my family was there just a few hundred meters away. I've never done anything harder than that. The fact that I had to fly all alone to Stockholm didn't make it better. I cried the whole way on the plane, which was only an hour though. the man next to me had a daughter that was in America as an au pair so we talked about that and he tried to make me calm down. He was really nice and I'm so glad he sat next to me. Funny though how nice people are when you're crying. When I came to Stockholm I had to wait for an hour for Klara and a STS staff member. It was horrible. I just wanted to call my mom or a friend but I couldn't because I knew it would just make everything even worse and I would panic. Instead of calling someone at home I called Carl that I had only been talking to for a few years. Let me tell you that was such a good decision. It helped so much and I am forever grateful for that phone call. (Thank you Carl, you're amazing). After an hour they came and we hung up. 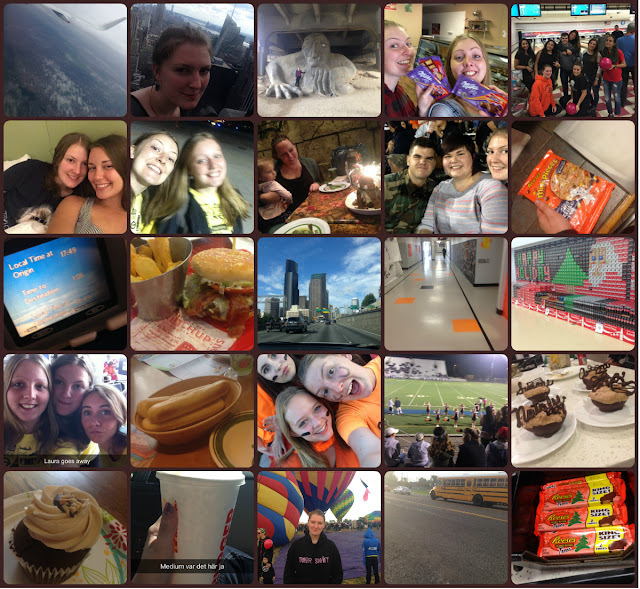 I was so glad I was starting this year long trip with Klara who I've known since last october. she was the first exchange student I found on internet and the first one I started talking to, and I am so happy we got the same departure date. Everything felt so unreal. I didn't cry more during the flights though, and I didn't cry the whole 5 days in NY. Everything still fet so unreal though, like I would be home in a couple of days again. After 5 days we said bye to each other and we flew to our host families. At the denver airport (where me and Ingrid had to wait for 4 hours) I called Linnea and I was so scared. I felt so small. What was I doing here all alone in this huge country. Somehow I made it and we finally arrived in Pasco where our host families were waiting. I knew I was gonna live with them for 10 months and I knew his city I had just flown over would be my home for the next 10 months, but everything was so unreal. I was truly in denial. Especially when we came to the house. Don't take this wring though, I really liked my host family from the beginning, but I came here late, I was really tired and everything just felt so wrong. I just wanted to go back home. Now. This was not my home. This was not my room. This was not my routines. I woke up every day with a lot of homesickness for at least three weeks, and I was so scared that it would be like this my whole year. As time went on I started to get in to my routines, and the house, my room, my host family and everything else. And after a little more than a month I felt so at home. And thinking of how it was in the beginning now is so weird. I could not have asked for a better host family. This is truly my second home, and I feel so safe. It really is true what the organizations tell you before you leave, the most important thing is the host family, because honestly, even if this year would be crap (in school, and other sparetime) I wouldn't even care, because I have the best host family you can imagine and thanks to them this will be the best year of my life, and I am forever grateful to them for that. So that I've been here for three months is kind of crazy. A little less than a third of my year has passed and I will do everything in my power to enjoy these last 7 months to the fullest. Thank you to everyone who made this possible, I love you all. Here is a collage of some pictures that shows a few moments from these amazing three months. AW IM SO GLAD YOU'RE ENJOYING IT NAT! !